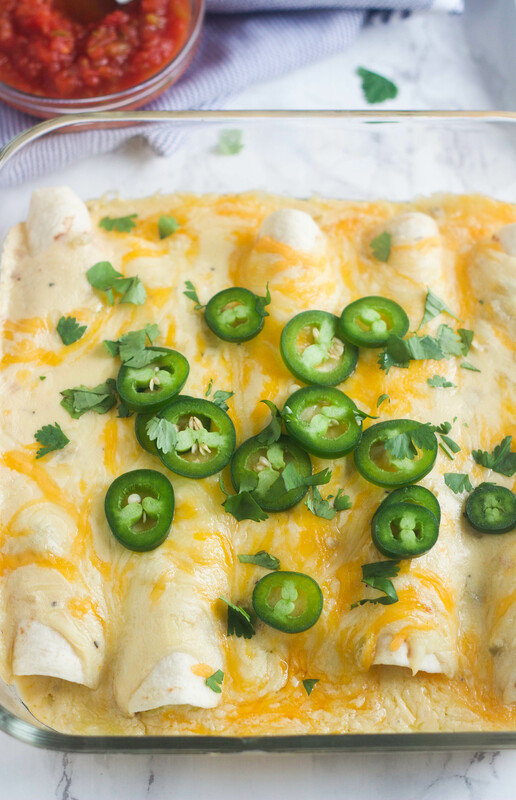 These Breakfast Enchiladas are stuffed with eggs, sausage and cheese and they’re absolutely delicious! They’re not just for breakfast either . . .they’re perfect for any meal. Breakfast Enchiladas. . . .have you ever made them? I make breakfast burritos all the time, but until recently I’d never made breakfast enchiladas. I’ve definitely been missing out. These little beauties are going to make you a breakfast hero at your house. They’re loaded with scrambled eggs, sausage, green chilies and melty cheese and then you top them off with a delicious cheese sauce, because can you ever have too much cheese? I think not! We love breakfast for dinner, so when I make these, it’s usually for dinner. If I ever do make them for breakfast, it will probably be on the weekend because who has time weekday mornings to make anything other than toast and cold cereal? You could easily make these the night before and just assemble up to the point of pouring the cheese sauce over them. Just make sure you warm up the cheese sauce before you pour it over the top. Cold cheese sauce is definitely not going to pour very well. Tops these off with some salsa, sour cream, cilantro, jalapeno slices, etc. . . they’re so good! Preheat oven to 350°. Spray a 9x13 pan with cooking spray, set aside. In a large skillet, cook sausage over medium-high heat, stirring frequently, until browned and crumbly. Remove from pan and pour onto a paper towel -lined plate. In a large nonstick skillet, melt butter over medium heat. Add eggs, green chiles, salt, pepper, and cumin. Cook, without stirring, until eggs begin to set on bottom. Draw a spatula across bottom of pan occasionally and continue cooking until eggs are thickened but still moist (do not stir constantly.) Remove from heat, and gently fold in the sausage and 1½ cups of the cheese sauce. Spoon about ½ cup of the egg mixture on each tortilla and roll up. Place seam side down in prepared pan. Pour enough cheese sauce evenly over tortillas, until covered (you might have some cheese sauce left). Sprinkle with pepper jack cheese. Bake until sauce is bubbly, about 30 minutes. Serve with desired toppings. In a heavy saucepan, melt butter over medium-low heat. Whisk in flour until smooth and cook for 1 minute, whisking constantly. Gradually whisk in milk and increase heat to medium. Cook, whisking constantly, until thickened, about 5 minutes. Remove from heat, and whisk in cheese, green chiles, salt, pepper and red pepper flakes.